Construction is now underway on part one of a new $25 million Quest Apartment Hotel development on the waterfront at Port Adelaide. Premier of South Australia Jay Weatherill was on site to perform an official turning of the sod ceremony alongside Smith Group Managing Director Hans Ehmann and Quest Apartment Hotels General Manager (Brand) Tony Gauci. “The new Quest Apartment Hotel will be a great addition to historic Port Adelaide, one of our city’s great tourist experiences,” Mr Weatherill said. “The Port is gaining momentum and this project is a significant step towards the area’s transformation into a more vibrant precinct for locals and visitors. 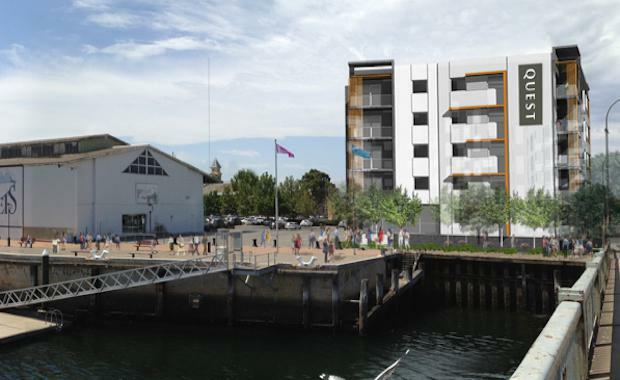 People staying at these apartments will be able to soak in South Australia’s colonial history, see dolphins in the Port river and experience the new weekend markets at Hart’s Mill. "Colliers International’s Jeevan Deut facilitated a pre-commitment from Quest for a circa 7,200sqm, five-level serviced apartment development. The standalone project will be constructed on a circa 3,500sqm site located in the Fisherman’s Wharf precinct in the heart of Port Adelaide. Quest Port Adelaide will feature 103 apartments over five levels, comprising studio, one, two and three bedroom configurations. The development also includes on-site parking, a conference room and gym. The Quest property will be located at 106 Nelson St in Port Adelaide and is expected to open in September 2016. Mr Gauci said Quest Quest Port Adelaide would provide much sought after, brand new apartment hotel accommodation for corporate travellers as well as leisure and business tourism traffic to the region. He said Quest was thrilled to be part of the Port Adelaide development plan, with this growth reflecting the company’s strategy for expansion. Mr Ehmann said Quest’s presence in the area would spark immediate interest and drive traffic to the historic shipping and industrial harbour.